A wonderful and interesting afternoon was spent listening to our guest speaker Kevin ‘Taff’ Stone, Chief Engineer with the Vulcan to the Sky Trust (VTTS). ‘Taff’ joined VTTS at the start of XH558’s restoration to flight and was with the team when XH558 made her first post-restoration flight in October 2007 through to her retirement from flying at the end of 2015. 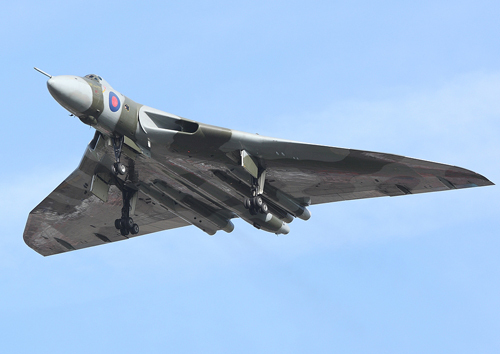 ‘Taff’ continues to be retained by VTTS as a consultant by VTTS, overseeing engine runs and XH558’s maintenance programme at Doncaster Robin Hood Airport (formerly RAF Finningley). He told us about the restoration to flight programme work and the engineering work needed to keep XH558 in the air during her eight seasons of display flying, with further insight into his RAF Career which included Vulcans and 558, but also other aircraft which included the Red Arrows.